IBM may need to ask Watson if there's anything that CEO Ginni Rometty (or anyone else for that matter) can do to get the company's sales growth back on track. Big Blue disappointed Wall Street again on Monday, reporting a 13% drop in sales -- bigger than expected. Shares of IBM (IBM) fell 6% Tuesday on the news. The strong dollar is hurting IBM -- more than half its revenue comes from outside its Americas division. IBM had noticeable weakness in the BRIC markets -- Brazil, Russia, India and China. But IBM can't just blame the greenback for its woes. Investors can't be pleased. IBM's stock has been flat during Rometty's tenure. During the same time, the S&P 500 and Nasdaq have surged. Of course, IBM is no Apple (AAPL), Google (GOOGL) or Facebook (FB). It's not an exciting consumer tech company. But the problem for Big Blue is that its stock has also lagged the performance of other "boring" software, services and hardware stocks, companies like Microsoft (MSFT), Oracle (ORCL), SAP (SAP), Hewlett-Packard (HPQ) and Accenture (ACN), since the start of 2012. To be fair, IBM is doing the right things to try and rejuvenate sales. Nobody can accuse Rometty or other senior managers of being complacent. She inherited a slow growth company three years ago. It's not as if IBM was a dynamic tech firm before she became CEO. Big Blue is investing heavily in cloud software and services, analytics and mobile and social initiatives. The company calls those businesses its "strategic imperatives." And their sales were up more than 20% from a year ago. But they are still too small to help offset declines elsewhere. IBM said that cloud revenues totaled $8.7 billion over the past 12 months. That is impressive. But it works out to only about 10% of IBM's overall revenue. Big Blue also doesn't break down exactly how much sales all of the "strategic imperatives" generate. The company was not immediately available for further comment about its most recent earnings report. 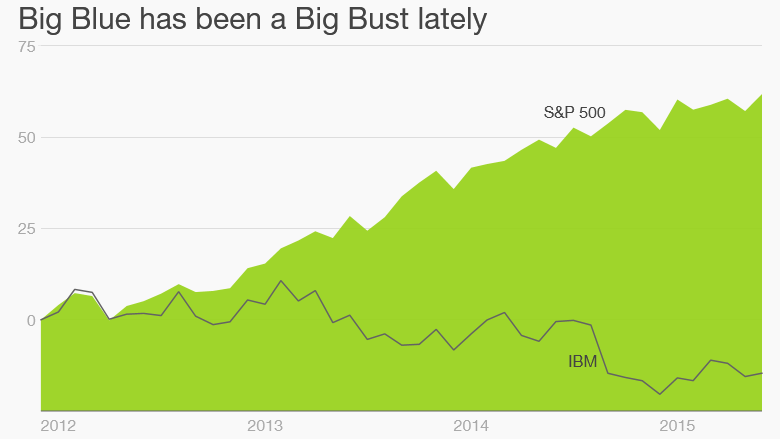 But many on Wall Street are growing increasingly bearish about IBM's prospects. James Kisner of Jefferies wrote in a report Tuesday that he thinks IBM will continue to "struggle to navigate business transitions in software and services." Kisner has an underperform rating on IBM, essentially a sell. His price target is $130 -- more than 20% below IBM's current price. Still, IBM has some fans that bleed Big Blue. Warren Buffett's Berkshire Hathaway (BRKB) is the largest owner of IBM's stock. And Berkshire bought more IBM in the first quarter. Mutual fund giant Vanguard, IBM's second largest shareholder, also boosted its IBM stake in the first quarter. So did top-ten shareholders Fidelity and Norges Bank Investment Management -- the sovereign wealth fund of Norway. The stock is cheap, trading at just 10 times earnings forecasts for next year. And it pays a healthy dividend that yields 3.2%. That should satisfy value investors and the widow and orphan crowd who like the stability that comes with quarterly income payments. Unfortunately, that might be the best you could say about IBM at this point. Wall Street is predicting that IBM's sales will fall 10% this year and be down again slightly in 2016. 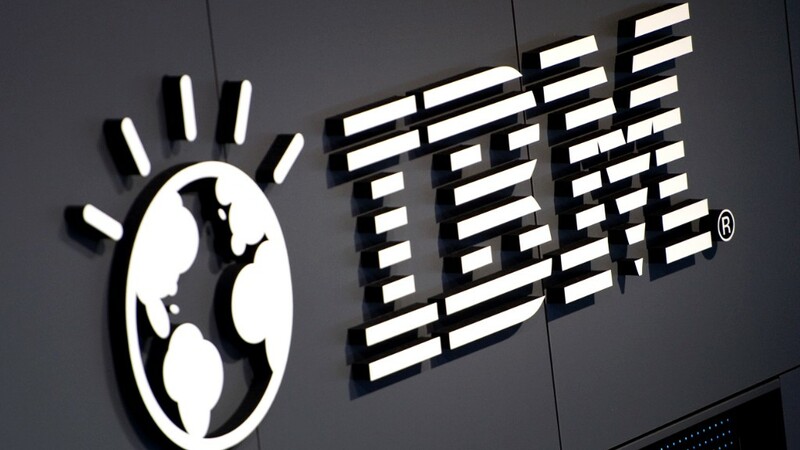 Janney analyst Joseph Foresi said in a report Tuesday that IBM might be getting closer to a bottom -- but that timing that bottom is tough to do given the sales declines in IBM's core businesses. And RBC analyst Amit Daryanani wrote in a report Tuesday that IBM is likely to remain dead money for the foreseeable future. "Investors should remain on the sidelines until better signs of positive revenue growth emerge," he said.